Advanced statistical research has grown over the past decade with the progression of sabermetrics, yet traditional news outlets and baseball broadcasters remain reluctant to present new-age metrics. Paradoxically, the statistics mainstream baseball journalists and broadcasters interpret as important (i.e. batting average and earned run average) are mathematically insignificant in predicting team success. The simplicity of these timeless metrics distorts their actual relevancy. Unfortunately, journalists and broadcasters rely on the public’s understanding of rudimentary baseball statistics, so the faux-importance of nonessential metrics is prolonged. The purpose of this article is twofold. First, using a regression analysis I will examine the relationship between wins, earned run average, and batting average. Secondly, I will identify specific metrics that correlate significantly to wins and team winning percentage. Once complete, I plan to use the findings of this study to construe a mathematical model using metrics strongly related to wins to appropriately rank baseball teams across leagues and generations. Henry Chadwick, a New York-based sportswriter, created the earned run average statistic in the early 1900s. Chadwick’s goal was to devise a metric that appropriated responsibility for earned runs that scored during a contest. The growth of relief pitching in the early portion of the century furthered Chadwick’s cause, allowing him to create a statistic that accounted for multiple pitchers performing in a single game. Prior to earned run average, pitching effectiveness was simply accounted for by tabulating wins and losses. The notion of a good earned run average has changed over time and is dependent on the era. For example, today an ERA below 2.00 is stellar, but it was a common mark during the dead-ball era of the 1910s. Other factors, such as the designated hitter and ballpark affects, influence how earned run average is observed. Traditional journalists and broadcasters use earned run average as a means to indicate success for two primary reasons – familiarity and ease of calculation. As stated, baseball statisticians have been calculating earned run average since the early 1900s. Fans understand what constitutes a good ERA and a poor ERA. The formula is also simple to understand and compute: earned runs allowed multiplied by nine, divided by innings pitched ((ER*9)/IP)). Chadwick also created the batting average statistic. A derivative from cricket, Chadwick altered the cricket formula to better measure individual batting ability and found hits divided by at bats to be a suitable statistic (H/AB). Similar to earned run average, what constitutes a solid batting average is often reliant upon the specific generation. Today, a .300 batting average is considered excellent while .230 is regarded as poor. Similar to earned run average, forward-thinking baseball statisticians argue batting average is a poor metric in measuring offensive performance because it has a significantly weak relationship to runs scored. Theoretically, the team with the highest winning percentage should rank among the top of the league in most statistical categories. Generally speaking, the majority of baseball fans look at batting average to indicate offensive success, and earned run average to indicate pitching success. True, both statistics can provide insight as to how a team performs, but analytically neither is a relevant predictor of winning. Both remain relevant because of their simplicity and familiarity. The purpose of this study is to disprove the myth that batting average and earned run average are strong predictors of wins. Mathematically eliminating these two metrics as variables will allow for the strengthening of game prediction and team-ranking models. I will examine the regression analysis and use T-statistics and significance values of each metric to conclude the importance level of each as they relate to wins. Fielding statistics are not included in the analysis because the available statistics are questionable. 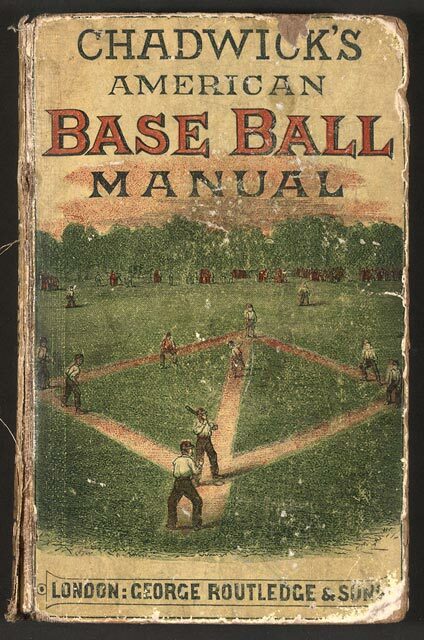 Fielding percentage does not include range and other such factors, nor are accurate fielding statistics available before the 1950s. Looking at the p-values, it is clear OPS, Rdiff and WHIP have a strong relationship to team wins. To the contrary, AVG and ERA both have p-values significantly removed from zero. You can also see OPS, Rdfiff and WHIP are the only categories with higher absolute value T-statistics of over two, demonstrating a strong relationship between the three categories and team win totals. To confirm the relationship, the only categories with P-values below .05 are OPS, Rdiff and WHIP. p-values of .05 or less are considered to represent differences that are less likely to occur by chance. 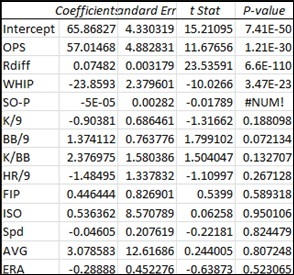 To reiterate, the absolute t-statistics for OPS, Rdiff and WHIP are each greater than two and the p-values are below .05, indicating a likely relationship with wins. None of the other variables indicated a strong statistical relationship (i.e., p < .05) with wins. Ironically, ERA and AVG contribute little to the prediction of a team's win/loss record. With these results we now know two unique pieces of information. First, AVG and ERA are nothing more than functional statistics that simply carry the benefit of familiarity. Neither metric correlates strongly to winning. Secondly, OPS, Rdiff and WHIP should be emphasized by traditional media outlets as statistics that relate to success. Compared to earned run average, WHIP more directly measures a pitcher’s effectiveness against the batters faced. The metric was invented by Daniel Okrent in 1979 and serves as a staple in fantasy baseball. Unlike ERA, WHIP is not adjusted for ballpark effects. On-base plus slugging (OPS) is a sabermetric rooted metric that combines on-base percentage and slugging average. The statistic measure a player’s ability to reach base and hit for power. Unlike the traditional batting average metric that does not differentiate between a single and a home run, OPS accounts for power. The statistic became popular in the mid-1980s and has become more recognized within the past decade. Run differential is exactly what it sounds like. This statistic is relevant only for a team and is calculated by subtracting the number of total runs scored by total runs allowed. Baseball is a game of tradition followed by self-proclaimed purists. Earned run average and batting average are simplistic metrics embedded in the fabric of the sport. I am not trying to render these statistics meaningless, but I do implore mainstream media outlets and broadcasters to cease the perpetuation of earned run average and batting average as vitally important statistics when better alternatives exist.